Several companies offer lightning protection devices that use a series of sharp-pointed electrodes mounted on the top of the tower. These are known as static ground charge dissipation systems and can be effective. It is also common practice to install a static discharge choke from the base of the tower to ground. However, if the standard ball gap is not properly adjusted it can cause more harm than good. AM towers, with their large and low-resistance ground systems, seem to suffer less damage from lightning. 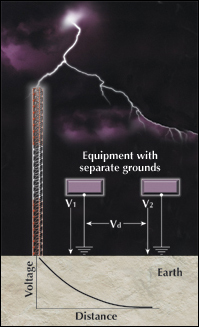 Once a lightning strike enters the tower, its path toward ground is determined by the reactance in its path. Because the rise time of the wave front is rapid a reactance that might normally be considered insignificant can develop catastrophic voltages, which can bypass ground paths and jump to adjacent objects. Different ground points can result in a voltage differential between devices. Alightning strike on a power line can enter through the line itself. Regardless of the amount of lightning activity in a station’s local area, surge protectors are essential. Some power lines contain intermittent spikes caused by load changes, as well as severe over-voltage surges caused by lightning. The surge protector should be located where the line enters the building, and additional surge protectors on individual pieces of equipment are advisable. It is essential that surge protectors be connected as closely as possible to the equipment to be protected, and in no case should long connecting cables be used. There should be only one ground system connection. Otherwise it is possible for high voltages to develop between them in the event of a heavy strike. The extensive ground system required by AM transmitters sometimes provides an ideal unity ground. However, all connections to this ground should be made with a flat, wide copper strap to ensure a low-impedance connection. If possible, bring all ground connections close together so that there can be no potential differences between them. If a lightning strike occurs near the transmitter building a voltage gradient will be produced across the area. If these three lines are brought through widely separated ports, surprisingly large voltages can develop between them if they are grounded in three places. Locating them together and connecting them to the same ground should reduce or eliminate lightning damage.